1)Which approach offers the best chance of achieving the required visual reference for landing at CYKF? The LPV (localizer performance with vertical guidance) offers the lowest minimums of 270 feet (ceiling) and advisory visibility of one statute mile (SM). Basically 300 & 1. 2)My GPS is not WAAS-equipped. May I fly the LPV approach? 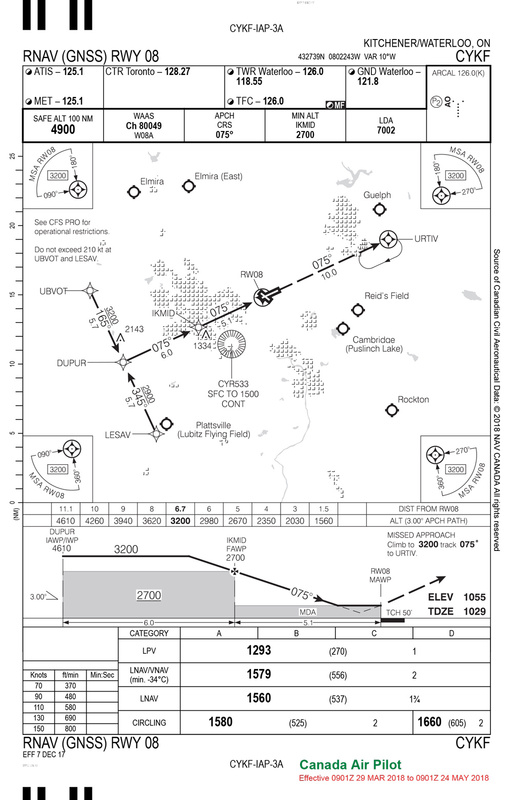 3)Which waypoints within the procedure are fly-over waypoints? 4)If doing the LNAV procedure, what minimum ceiling and visibility are needed to establish the required visual reference when landing on RWY 08? A ceiling of 537 feet (really 600 feet) and advisory visibility of 2 SM. 5)If flying the LNAV approach via a CDFA (continuous descent final approach) from 3,200 feet ASL, when should the descent be initiated? 6.7 nautical miles (NM) back from the MAWP of RW08. 6)Relative to the above, what would be the sink rate requirement if your groundspeed on the approach is 100 knots? 530 feet per minute (FPM). 7)What would be your course of action upon arrival over the clearance limit, without further clearance in the event of a missed approach? Hold as published at URTIV at 3,200 feet.